See beyond the belt buckle glitter of Nashvegas to the low lights and simple sides of the gum-smackin' city's biggest stars. Thursday the Georgia Music Hall of Fame opens its latest exhibition "Nashville Portraits: Photography of Jim McGuire." Inspired by photographer Irving Penn's portraits of tradesmen in their work clothes, McGuire began what has become his acclaimed series of “Nashville Portraits” in1974. The series now includes more than 1,000 images of America's most influential singers, songwriters and musicians. 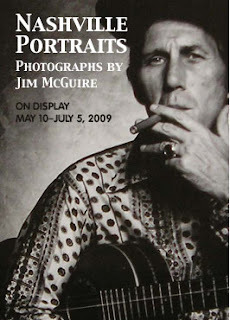 The exhibit features 60 of the best photographs, including Georgia musicians Tut Taylor, Norman and Nancy Blake and Georgia Music Hall of Fame inductee Chet Atkins. Mom, however, is super excited to see her favorite nine to fiver Dolly Parton's portrait, circa 1974, where her bell bottoms bloomed bigger than her . . . guitar. McGuire will be on hand during the opening reception, which takes place from 6:30-8 p.m. It's free and open to the public, so show your support for the Georgia Music Hall of Fame by giving its latest exhibit a warm Macon "S-a-a-a-lute!" After the opening, forget the Grand Ole Opry because the afterparty is at the Hummingbird Stage and Taproom. In honor of the new exhibit, the GMHF hosts a stellar live music show featuring T. Graham Brown, Jimmy Hall and Austin songstress Toni Price (she played the wedding reception of Julia Roberts and Danny Moder!). The show starts at 8:30 p.m. and is a $5 cover for GMHF members and $10 for the rest. Put on your dancing shoes . . . or better yet, take them off and boogie barefoot.